The classic gin and tonic. Photo courtesy Martin Miller’s Gin. Today is World Gin Day, a holiday created by Neil Houston of Birmingham, England. It started modestly in 2009 when Houston. who reviews gin on his website, Yet Another Gin, gathered some friends. It has since turned into a worldwide celebration. 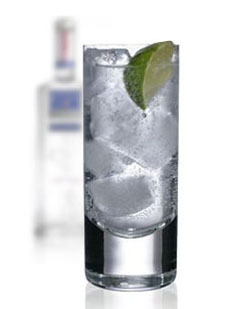 We’ll go for the G&T: as delicious as it is simple to prepare. There’s also National Gin & Tonic Day, April 9th. 1. FILL a highball glass with ice cubes. Add the gin, tonic water and lime juice. Stir thoroughly to blend. 2. GARNISH with lime wedge and serve. Simply freeze tonic water in an ice cube tray. We use a covered ice cube tray to keep the cubes tasting fresh, but you can use plastic wrap. Historically, spirits were created for medicinal purposes. So was the G&T. Malaria was a persistent problem in the world‘s tropical regions. In the 1700s, quinine, a muscle relaxant developed from the bark of the cinchona tree by the Quechua natives of Peru, was found to be helpful in treating the disease. Like much medicine, quinine had an unpleasant, bitter taste, even when diluted in water (quinine water). In the early 19th century, someone (an officer? a bartender?) suggested adding gin, the spirit of choice, to make the medicine more palatable. Thus emerged the Gin & Tonic: tonic water (quinine water) by adding sugar, lime and gin to the quinine. The first quinine water was not carbonated. With the expansion of carbonated beverage, fizz was added, and it was given another name, tonic water, to express its value in cocktail culture. Today’s quinine water contains much less quinine, since it is no longer used as an anti-malarial. That’s why some people enjoy it as a soft drink. And note that mass brands contain artificial quinine—it’s much cheaper. For the real quinine experience, try an artisan brand like Q Tonic.